The laser beam used for adaptive optics exits the dome of Lick Observatory's Shane Telescope. The white dome directly in front of the Shane is the Automated Planet Finder, the observatory's newest telescope. Photo by Laurie Hatch. For 50 years, the 3-meter Shane Telescope has helped keep Lick Observatory at the forefront of modern astronomy. It has been used by University of California astronomers for pioneering research on everything from quasars to extrasolar planets, as well as for the development of cutting-edge technologies such as adaptive optics, now used to sharpen the vision of telescopes around the world. Lick Observatory is celebrating the 50th anniversary of the Shane Telescope on Saturday, September 26. Tickets are still available for the event, which includes a strolling dinner; a lecture on extrasolar planets by UC Berkeley astronomer Geoffrey Marcy; tours of the observatory; and (weather permitting) viewing with the telescopes. For details and reservations, visit the Lick Observatory web site or call (831) 459-5003. The Shane Telescope, completed in 1959, was named for Donald Shane, who was director of the observatory during the telescope's design and construction. With its 3-meter (120-inch) primary mirror, it was the second largest telescope in the world for 16 years. Although no longer among the largest telescopes in the world, it is still heavily used by UC astronomers and continues to yield important scientific discoveries. A major upgrade of the telescope's adaptive optics capabilities is currently under way, thanks to a $2 million grant from the National Science Foundation (NSF) to adaptive optics researchers at UC Santa Cruz. Demand for time on the 3-meter telescope is already high and is expected to increase, said Michael Bolte, professor of astronomy and astrophysics at UCSC and director of UC Observatories (UCO). Recent examples of major science programs involving the Shane Telescope include the discovery of planets orbiting other stars and the use of supernovae to measure the expansion of the universe. "The majority of the first 100 extrasolar planets were discovered based on observations with the Shane Telescope," Bolte said. "And the combination of two telescopes at Mt. Hamilton, the Shane and the Katzman Automatic Imaging Telescope, has proven to be extraordinarily powerful for discovering and characterizing supernovae throughout the nearby universe. This work, led by Alex Filippenko at UC Berkeley, is the basis for using supernovae to map the expansion history of the universe, leading to the discovery of dark energy." Much of the early research with the Shane had to do with understanding quasars and identifying the source of their enormous energy as the supermassive black holes at the centers of galaxies. Another major effort over many years involved the characterization of galaxies throughout the local universe. Led by Sandra Faber, University Professor and chair of astronomy and astrophysics at UCSC, these studies established what are today standard techniques for measuring the properties of galaxies and provided the basis for comparisons with more distant galaxies. The Shane Telescope has also served as the proving ground for several important advances in technology related to astronomy. The switch from photographic plates to early electronic detectors, and ultimately to the CCD cameras that are now standard for astronomy, was pioneered at the Shane Telescope. And the Shane played a key role in bringing adaptive optics (AO) technology to astronomy, enabling ground-based telescopes to overcome the blurring effects of turbulence in the Earth's atmosphere. The Shane Telescope was one of the earliest to experiment with adaptive optics for astronomy. 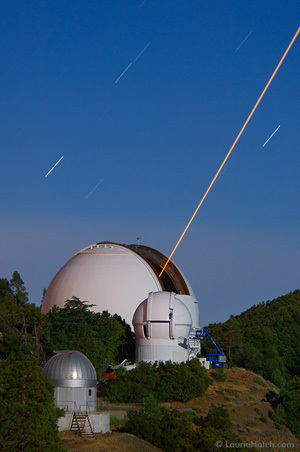 With the addition of a laser beacon in 2003, it became the first telescope with a laser guide-star AO system in use for regular astronomical observing. The laser creates an "artificial star" in the sky to serve as a reference point for the AO system, which measures distortions in the image and then uses a deformable mirror to apply corrections hundreds of times per second. The current AO system at Mt. Hamilton was developed in the early 1990s by a team led by Claire Max, then at Lawrence Livermore National Laboratory and now director of the Center for Adaptive Optics (CfAO) and professor of astronomy and astrophysics at UCSC. Max also led the development of the laser guide-star and other components of the AO system for the W. M. Keck Observatory in Hawaii. With the new NSF grant, researchers will replace key components of the Shane's AO system, now more than 10 years old, with state-of-the-art technology. The original deformable mirror--a hand-assembled glass mirror with transducers glued to the back to adjust its shape--will be replaced with a more advanced mirror based on MEMS (micro-electro-mechanical systems) technology. "The deformable mirror is the heart of the adaptive optics system, and the MEMS mirror lets the system correct the images to a much finer degree than the old one," said Don Gavel, director of UCSC's Laboratory for Adaptive Optics (LAO) and principal investigator on the NSF grant. Gavel, Max, and other LAO and CfAO researchers have been working with MEMS manufacturers to perfect a device design that is suitable for use in astronomy. The NSF grant will also fund a new infrared science camera with a larger area and more sensitive detectors, as well as a planned upgrade for the laser system. "With the newer system, scientists will be able to use the AO system for observations over a much broader range of infrared wavelengths," Gavel said. "It injects new life into the system and opens it up to a large array of new science projects." In addition to celebrating the Shane Telescope's 50th anniversary, the September 26 event at Mt. Hamilton also marks the 400th anniversary of the first use of an astronomical telescope (by Galileo Galilei in 1609) and will highlight the completion of the newest telescope at Lick Observatory, the Automated Planet Finder. The event will include the inaugural presentation of the James Lick Award, established to honor individuals or organizations that have significantly advanced the mission of Lick Observatory. Additional information about the Shane Telescope, including a description of the arduous process of transporting the 10,000-pound glass for the mirror up Mt. Hamilton, can be found on the UCO/Lick web site.